There’s always a risk in taking out a loan, even more so when you make that loan on a blockchain. That fact is perhaps no better understood than by those building the programmatic lending platform MakerDAO, which, having created the first widely used U.S.-dollar stablecoin on ethereum, the DAI token, is responsible for one of the most groundbreaking decentralized finance applications to date. “The success of Maker and DAI is not only a testament to the innovation happening within the ethereum community, but also to the flexibility and utility of the ethereum platform itself,” said Brian Mosoff, CEO of Ether Capital, who announced an investment of $1 million in MakerDAO tokens two weeks ago. Indeed, it’s widely agreed DAI is becoming a needed source of financial predictability and liquidity in the ethereum economy. “It’s much simpler to hold a stablecoin. It makes the budgeting totally predictable,” explains Lane Rettig, independent core developer and volunteer project manager of ethereum. But unlike most other dollar-backed stablecoins of its kind, the value of DAI doesn’t actually come from the creators of MakerDAO, but rather users that leverage a feature called a “Collateralized Debt Position” (CDP). Users that want to generate new DAI take out a loan by using their own ether as collateral. What’s more, for the entire duration this amount of DAI is in circulation, it’s up to the users – not MakerDAO – to ensure they have sufficient reserves to back its value until the DAI is returned and an accrued fee (currently 7.5 percent) is paid. Only then is the ether held in a CDP released back to a user. It goes without saying that this comes with a considerable amount of risk to the user borrowing DAI, given that sudden drops in ether price may devalue collateral held within a CDP. Should the value of any contract fall below the minimum collateralization ratio of 1.5 ETH to DAI, the MakerDAO system will forcibly liquidate a user’s CDP and sell all staked ether automatically at a 3 percent discount to cover outstanding DAI debt – all this on top of a 13 percent liquidation penalty. To date, software engineer for ethereum research and development startup Decenter Nenad Palinkasevic tells CoinDesk roughly 37,000 ETH – over $5 million – has been lost due to this liquidation penalty fee. In addition, Palinkasevic highlights that out of the 16,249 CDPs that have been created by users in total, roughly 14 percent or 2,278 CDP smart contracts have ended up forcibly liquidated to date. An unfavorable outcome for users, there are a number of third-party applications currently being tested to take the risk out of CDP risk management. One of these applications live on ethereum test network Kovan and markets itself as the “complete, one-stop solution for CDP management” on Reddit. Engineered by Decenter, CDP Saver is a web application envisioned to prevent CDPs from liquidation – automatically. At present, users must keep a careful eye on the value of their ETH collateral being stored within a CDP. If the user thinks that their CDP will fall below the minimum collateralization ratio, they can either lock up more collateral to boost up the ratio or simply close the CDP and pay back the full amount of their loan in DAI. CDP Saver dashboard. Image courtesy of Decenter. But there’s also a third way to save CDPs from liquidation, as explained by Palinkasevic. Rather than wiping the entirety of their debt, users can partially “unwind” their CDP through the CDP Saver. The first step to unwinding a CDP is drawing an available surplus of ETH collateral and swapping it on a cryptocurrency exchange for DAI. Then, the newly converted DAI is used to repay a portion of owed CDP debt and thereby increase the collateralization ratio. The CDP Saver also alternatively features a function called “Boost” to perform the exact reverse of repaying CDP debt. Using Boost, users would be able to initiate conversions of DAI into ETH and decrease their relative collateralization ratio. At present, currency conversion on CDP Saver is carried out through a decentralized cryptocurrency exchange platform called Kyber Network. And while Palinkasevic insists a first version release of the application on ethereum mainnet is coming “soon,” he also admits that the first release of the platform will only allow users to Repay and Boost their CDPs manually. Once a repay is triggered, users will be required to pay a small fee for leveraging the CDP Saver tool. Details about the exact fee amount is yet to be determined, according to Palinkasevic. To date, over 80 million DAI tokens have been liquidated, with one infamous CDP smart contract – CDP 3228 – being liquidated back in November 2018 for nearly 7 million DAI. At the time, this accounted for approximately 10 percent of the total DAI supply, according to MakerDAO community lead David Utrobin on Reddit. Even so, new CDP contracts are being opened every day. Thus far, in 2019, over 6,000 new CDPs have been opened. 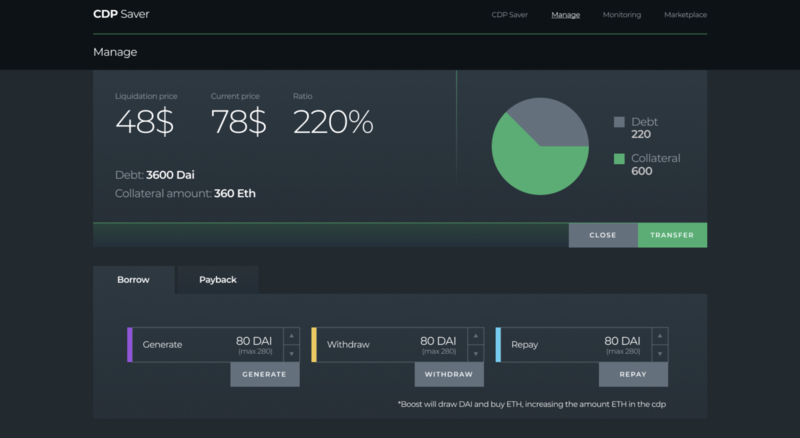 To a growing user base of DAI holders, CDP management tools like the CDP Saver are just one of a myriad of third-party applications being built and released. As highlighted by MakerDAO core community lead David Utrobin on a weekly community call, a new application called Keydonix has recently launched. It enables “one-button” closes of CDPs such that users who “are close to being liquidated” are able to pay back DAI debt more quickly. InstaDApp currently hosts a webpage called MakerScan where users can track CDPs, receive automated alerts about their activity, bolster collateral to CDPs by donating ETH, among other functions. Jain adds that InstaDApp is also working to develop more complex alerting mechanisms similar to the ones being tested by CDP Saver. “We are currently working on more complex alerts. So in the future, we’ll also provide whenever the [collateralization] ratio is above this then give the alert to deposit more ETH or pay some more DAI,” highlighted Jain.